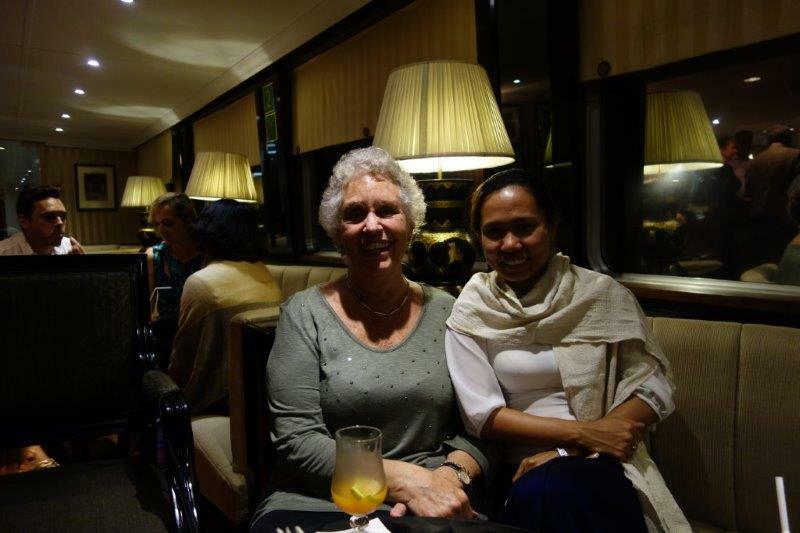 I was very excited about my ‘cruise’ up the Ayeyarwady River with Belmond (known as The Orient Express until 2014) and hoped to learn as much as possible about Myanmar. Burma has a rich and imposing history, and I’ve been told that a trip to Burma is like a trip back in time, to an era when Southeast Asia was blissfully free from the modern blight of mass tourism. Burma is what Southeast Asia once was, what it should be, and what it still is like in our dreams. I was also told that this is the country where Yangon (Rangoon), Burma’s capital, still feels like the British only left yesterday. 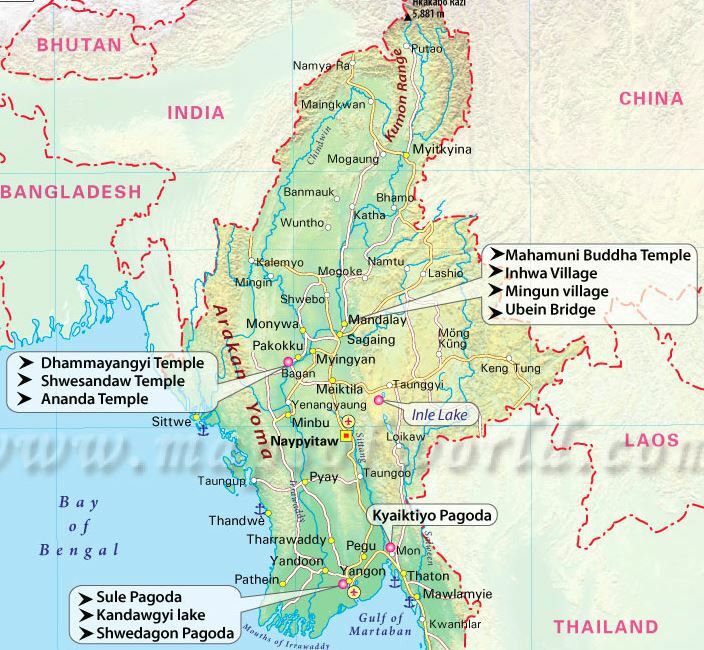 This is the land of golden stupas, Buddhas and even rocks (Golden Rock which I’d love to visit but I think will be a step too far in the time available)! I’m anticipating endless temple-filled plains (some say more impressive than Angkor Wat which I haven’t seen). The country can boast of Mandalay and its royal cities, Inle Lake with its floating villages, and exotic tribes rarely visited by Westerners. As I’ll be going both to Mandalay and to Inle Lake, I’ll be able to report whether or not there’s truth in these claims of friendly locals and a diversity of food only rivalled by Malaysia. So I’ll forget the many stereotypes and images associated with travelling in Southeast Asian countries such as malls, drug-induced full moon parties, backpacker streets full of bars and nightclubs, and, instead, take the famous road to Mandalay, albeit on a boat rather than by road. So it was a very early start on Saturday because I had to report at Yangon airport at 5.15 am. I was just able to grab a quick photo of the very famous Shwedagon Pagoda from the window of the apartment before we set off for the airport. 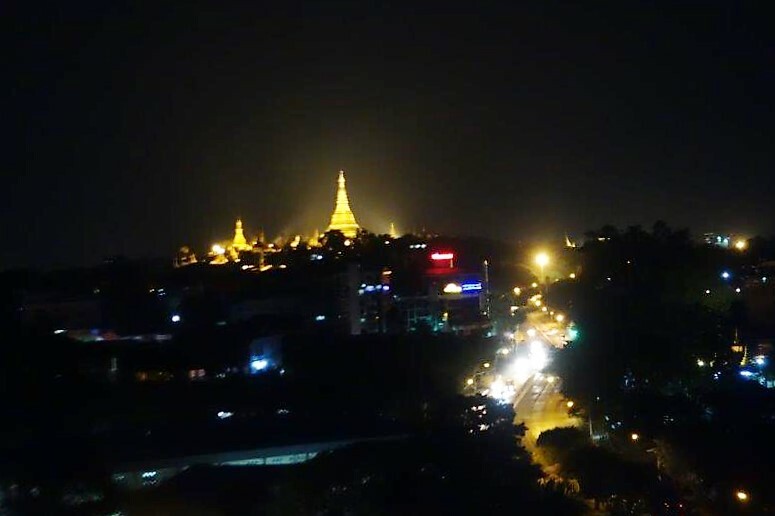 Visiting that when I get back to Yangon is something I’m really looking forward to. Adam very kindly got up early too and came with me because his flight back to Singapore for the weekend was at 8.00 am. 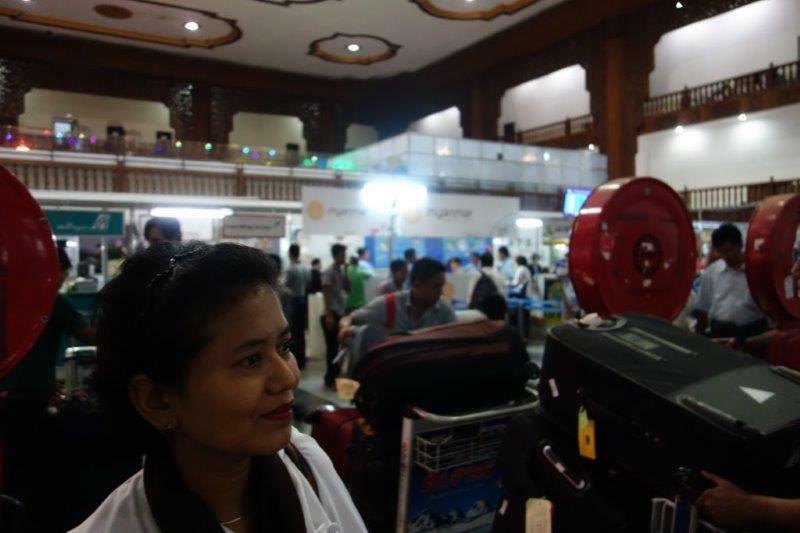 He was able to get a Visitor Pass into the lounge where we ‘cruise passengers’ congregated before our flight to Bagan. At least there was time for a bit more chatting and I knew that he would have a lovely weekend with Jan and Cameron back in Singapore as I set off on my adventure. It turned out to be a very big day! Not only had it started at 4.00 am when we got up but we had the flight to Bagan and then a pretty full day of sightseeing before we reached our boat, ‘The Road to Mandalay’. Yangon Domestic Airport was ‘interesting’. Probably smaller than Wellington it was crowded to the gunwales, even at that time of day. Our cases were taken away from us by the crew and we didn’t have to check in. We just made our way to the lounge and waited to board. And when Adam departed and we made our way to our plane, it was a walk across the tarmac. That wasn’t a hardship but we boarded at the back of the plane and the heat and smell from the engine exhausts was intense and I couldn’t wait for the queue to move so that we could get inside. Having said that, it was a comfortable flight and the crew were extremely helpful and friendly. 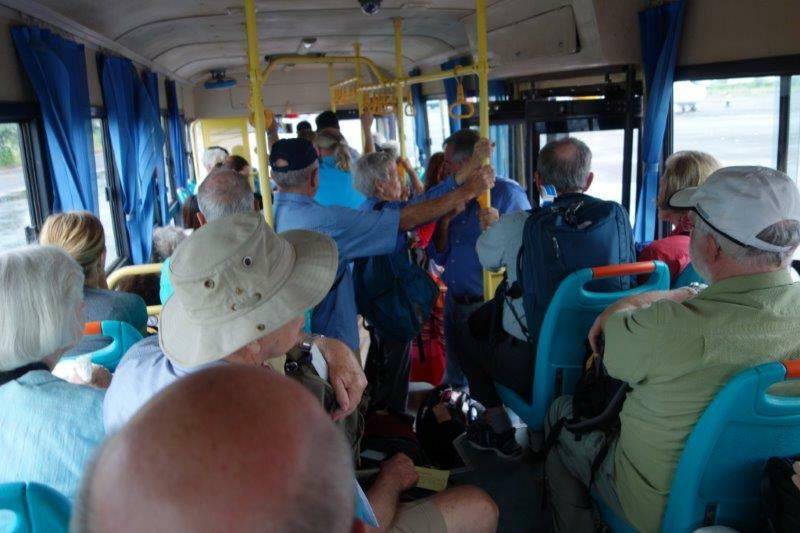 As soon as we landed at Bagan, we were taken in buses to the terminal in the usual somewhat unceremonious way. Here, however, we were met by a crowd of Belmond staff who took over and have made sure ever since that we don’t lift a finger! We boarded a Belmond coach and the sightseeing started. Our tour guide was Yi Mon and she was hugely knowledgeable and very kind and thoughtful. The first stop was the market. 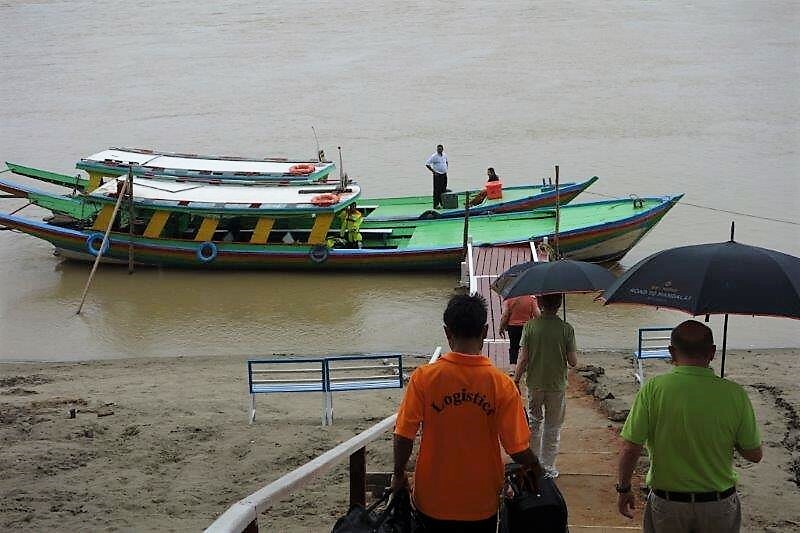 It was a wet day and we had left Yangon in dry conditions so were not prepared for the rain that had fallen in Bagan. Most of us were in sandals and the sandy road coupled with the puddles was rather unpleasant. 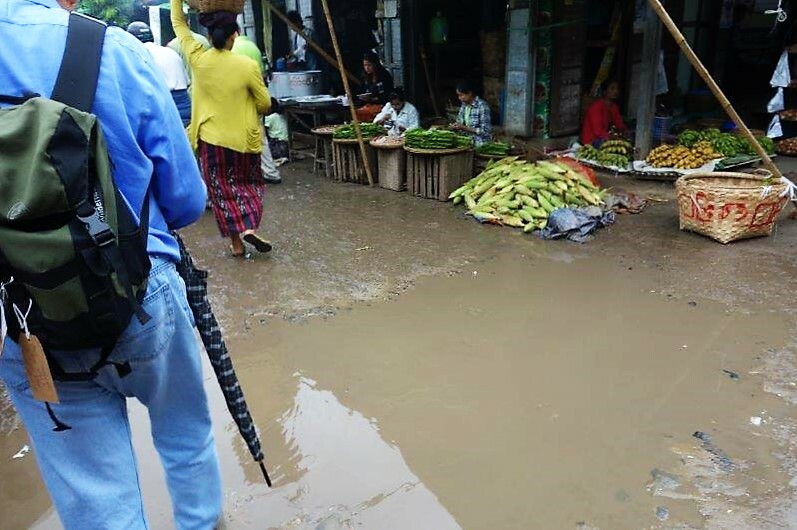 Having been to markets in Thailand and India, I have to admit that this adventure wasn’t the most pleasant experience. 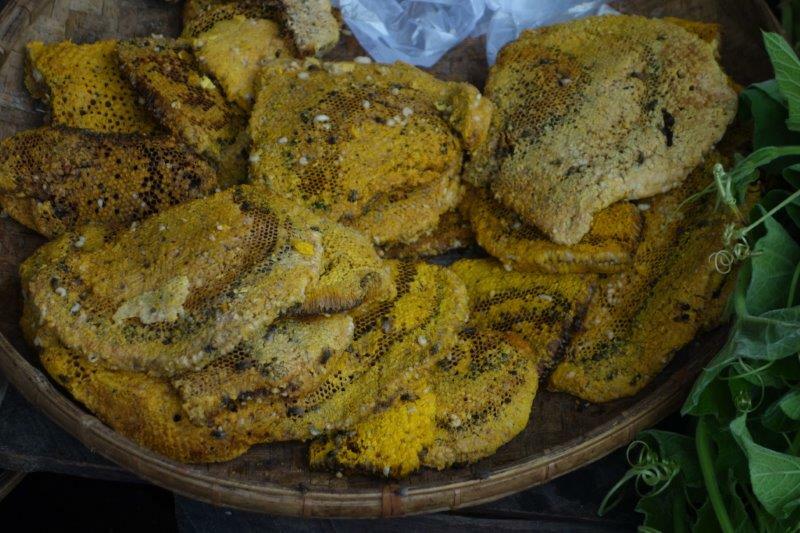 The flies on the honeycombs and the chicken pieces were really ‘gross’ and when we reached the boat for lunch I jokingly asked the chef where the chicken came from for the soup. 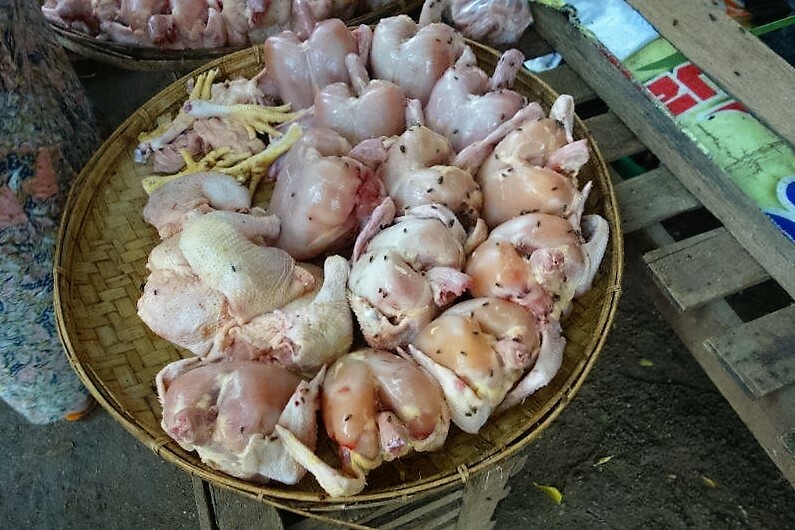 She roared with laughter and reassured me that it definitely didn’t come from the Bagan market! From the market, we went to the Thanbula Temple which was built in 1255. 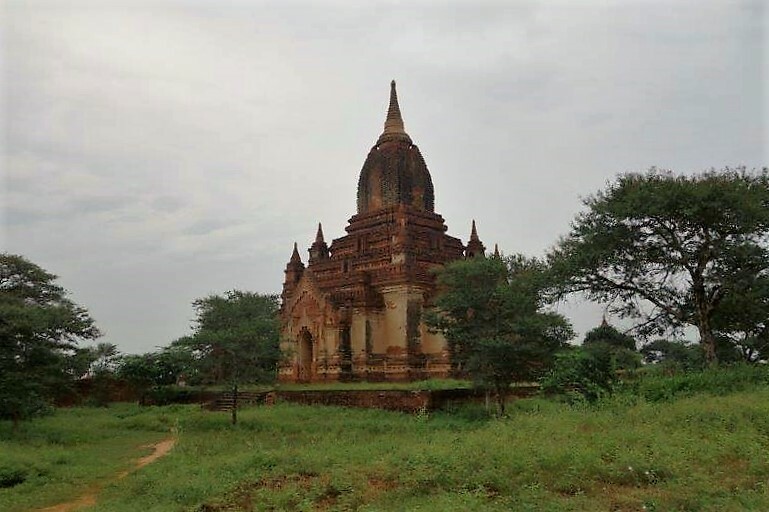 It is representative of a single-storeyed temple in the ‘Late Style’ and takes its name from its builder, Queen Thambula, consort of King Uzana (1247-1256). It’s a square structure with porches on all four sides. The interior, well lit by two high arched entrances, has mural paintings throughout but they were not in very good condition so it was hard to see what they depicted. 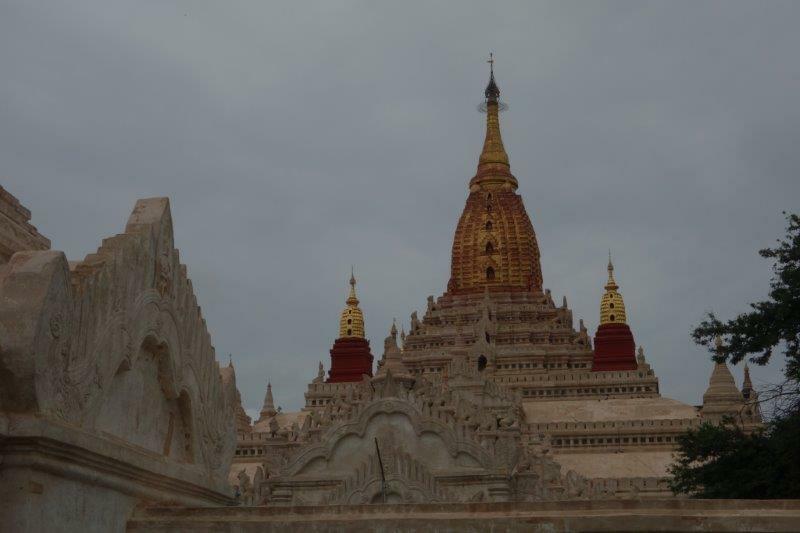 From here we moved on to the Ananda Temple located in Old Bagan. It’s a Buddhist temple (as most are) that was built in 1105 AD during the reign of King Kyanzittha (1084-1113) of the Pagan Dynasty. 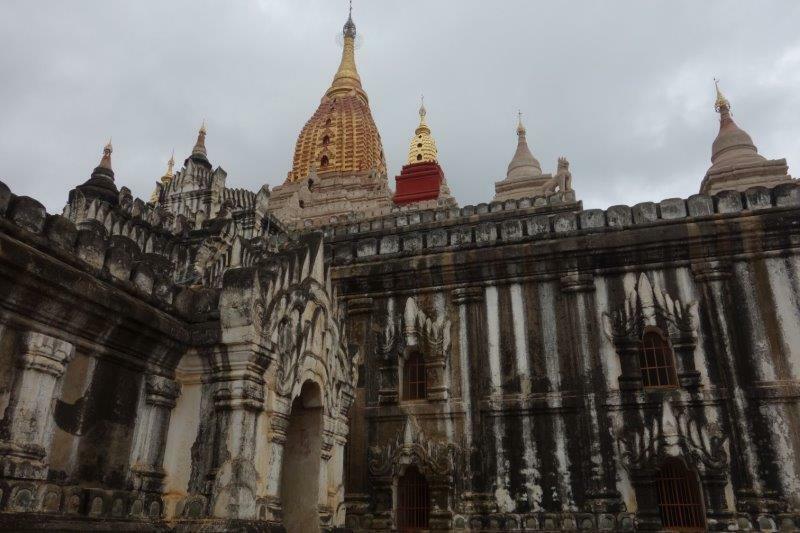 It’s one of four surviving temples in Bagan. The temple layout is in a cruciform with several terraces leading to a small pagoda at the top covered by an umbrella known as a ‘hti’. (This is the name of the umbrella or top ornament found in almost all pagodas in Myanmar). It houses four standing Buddhas, each one facing the cardinal direction of East, North, West, and South. From a distance, this one appears to be smiling, but when you get up close, the perspective changes the expression somewhat. The temple is said to be an architectural wonder in a fusion of Mon and the adopted Indian style of architecture. It is impressive and has been called the ‘Westminster Abbey of Burma’. The temple was damaged in the earthquake of 1975. 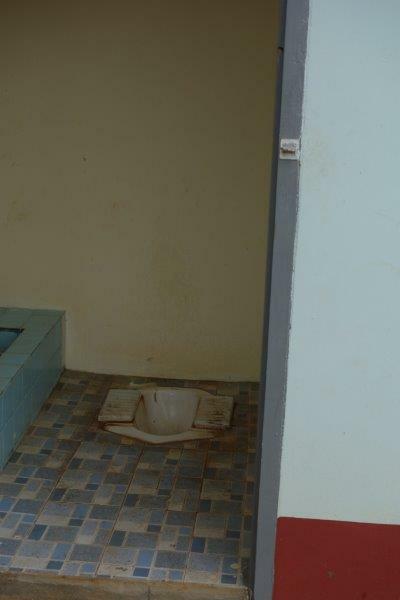 However, it has been fully restored and is well maintained by frequent painting and whitewashing of the walls. 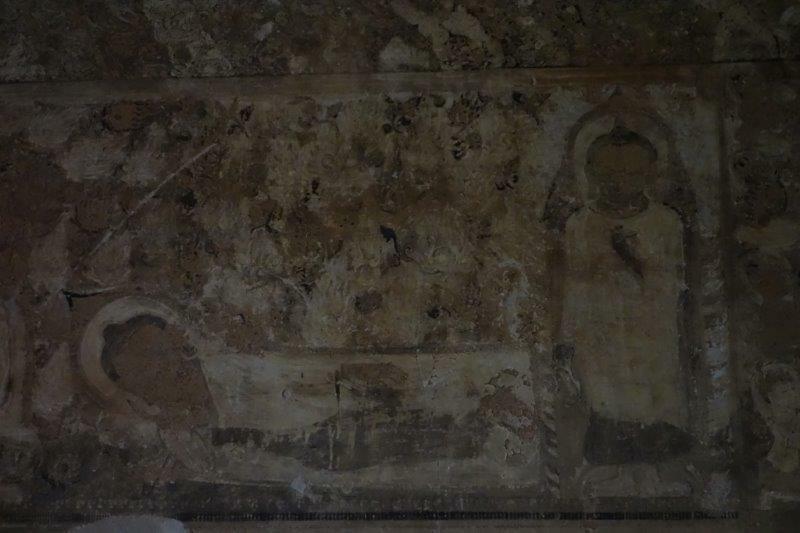 Unfortunately, the whitewashing has covered some of the mural paintings so the layers of whitewash are being painstakingly removed – in this case, five layers, one by one (from left to right). On the occasion of the 900th anniversary of its construction celebrated in 1990, the temple spires were gilded. 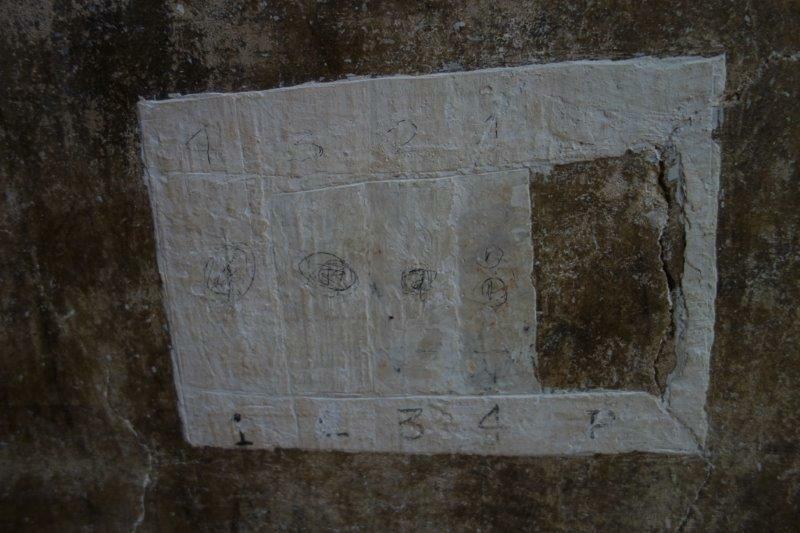 We didn‘t like the fact that the walls of the temple were covered in mould and looked as if they were in need of a good clean. However, Yi Mon told us that some people feel as we do and others really like the comparison. Legend has it that the building of this temple ended in tragedy for the builders (although it runs contrary to Buddhist teaching of ‘not killing’). 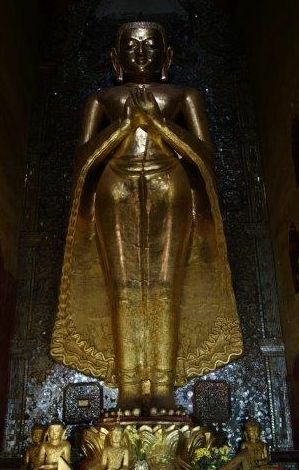 Eight monks who approached the King Kyanzittha gave a graphic description of the Nandamula Cave temple in the Himalayas where they had meditated. When the King invited them to the palace to hear more details, the monks invoked their meditative psychic skills and vividly explained to the King the landscape of the place they had lived. The King, pleased with this show of their skills, requested the monks to build a temple in the middle of the Bagan plains, creating cool conditions in the temple. After the monks completed the temple construction the King, in order to retain the uniqueness of the temple, got the architects (monks) killed to ensure that another similar structure was not built by them anywhere else. Our next stop was a visit to Minnanthu Village, a small village which has only just got electricity (because, we were cynically told, ‘elections will take place next week’). 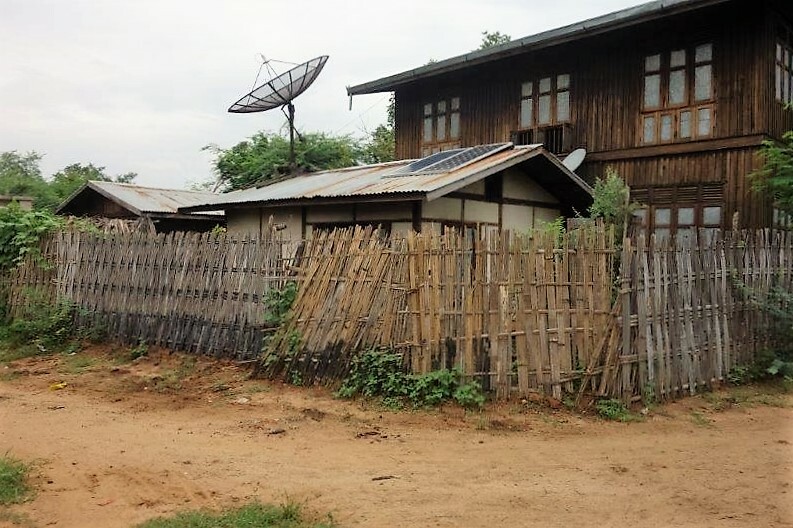 This has seen the arrival of TV and we were astonished to see the comparison between the poor condition of the housing and fencing and the very large, modern, satellite dishes! 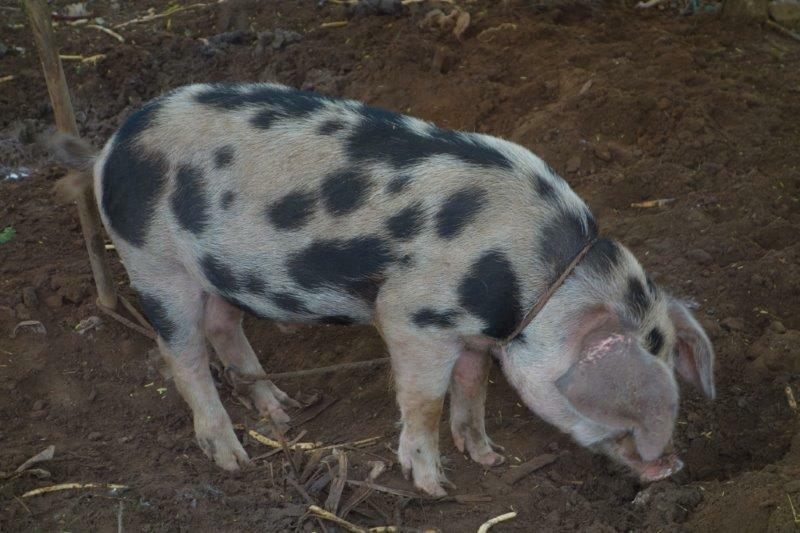 The village produces many interesting items including textiles, silver articles and jewellery but we didn’t see as much evidence of this as we did of the variety of animals from chickens, to oxen, slightly different-looking pigs and, of course, heaps of dogs. At this point it was time to board our boat, my home for the next week. I don’t know how I’d imagined we boarded, but it wasn’t quite like this! Every time we left the boat for an excursion we were transported to and fro in this little boat. The crew took enormous care of us. On this occasion, particularly because it was raining, the decks were slippery and the headroom limited. In addition, the level of the water in the river had dropped significantly so the climb down from the coach was long and steep. 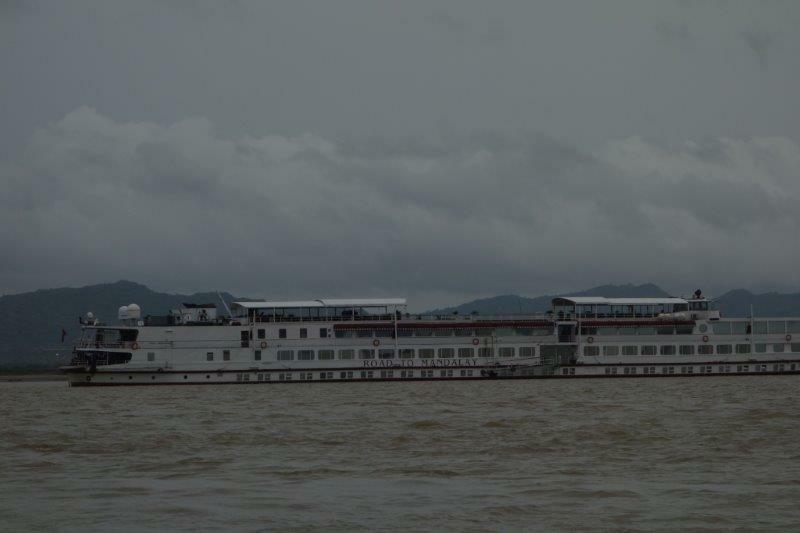 But there, anchored in the middle of the Ayeyarwady River was the ‘Road to Mandalay’ which, I soon discovered, had everything we could possibly want on board – and much, much more. With only forty passengers on board at this stage of the journey and 72 staff, each one of us was escorted personally to our cabin and all our amenities were pointed out to us. My little cabin on the lower deck provided all the comforts of home with its very comfy large single bed, en suite bathroom, wardrobe, chest of drawers, desk and stool and even satellite television. I checked the channels quickly to make sure I would be able to watch the live final of the Rugby World Cup the following evening. But I needn’t have worried. The staff received requests from one or two of the other passengers (even though there were no other New Zealanders on board) and they put up a huge screen in the main lounge on the upper deck and several of us watched it together. I had a few anxious moments in the second half but the outcome of a 34-17 win to give the All Blacks back to back World Cup wins – the first time a country has done that in the history of the Cup – was wonderful. Even though I had done absolutely nothing towards the win, other passengers were full of congratulations on Sunday morning! 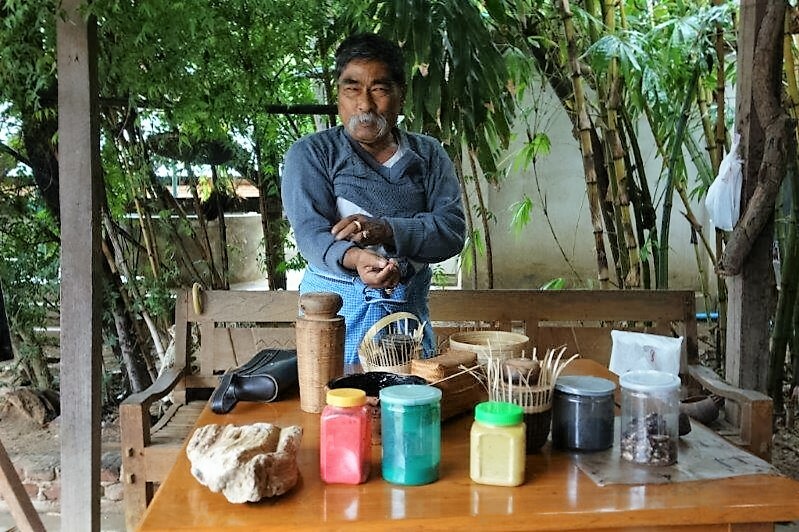 But we hadn’t finished our sightseeing on Saturday yet and we made a trip to a place called Everstand Lacquerware Workshop, owned and run by a man called Nanda Win Maung. The art of traditional lacquerware dates from the 11th century AD, the golden period of Bagan. The lacquerware technique starts with a wicker-work of woven, finely cut strips of bamboo, horse hair, and wood. Other essential materials include a mixture of lacquer resin with clay, wood, sawdust, and ash that are carefully built up and finely polished with the ash of fossil wood. The designs are then elaborately etched or painted by hand. Myanmar’s traditional lacquerware drawing styles derive from several Jataka stories of Buddha. The traditional lacquerware from Everstand is one of ten different flowery arts and crafts of the Golden Land. 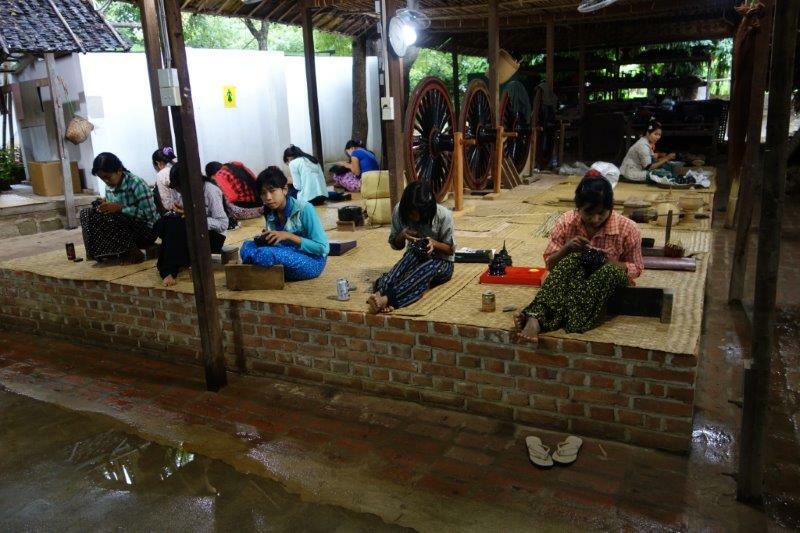 It is a constant source of fame and Bagan is the lacquerware heartland of Myanmar. 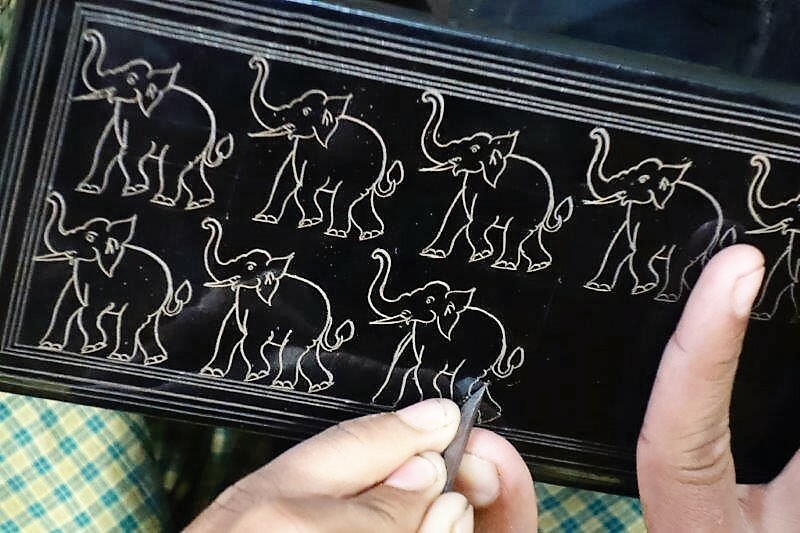 Items can take months to produce, not only because of the intricate carving that is involved but also because of the number of layers of lacquer that are applied. Given my love of Indian elephants I had to succumb to the purchase of a tray which had 20 layers of lacquer and was signed on the underside by the master himself. 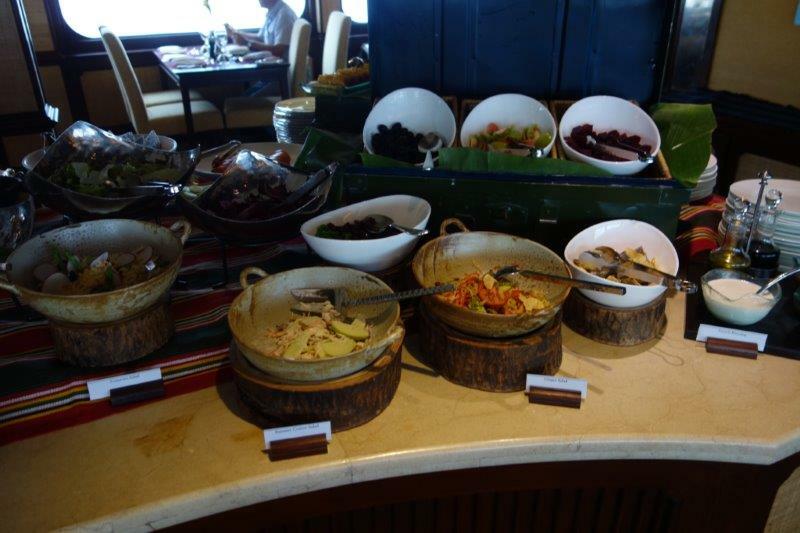 Because the items are made of teak or bamboo (my tray is made of teak) they are very light so I felt I could confidently take it home without going over my baggage limit provided, of course, that I can get it through Customs. Before a beautiful dinner on our return to the boat, we were invited to lovely pre-dinner drinks in the piano bar. 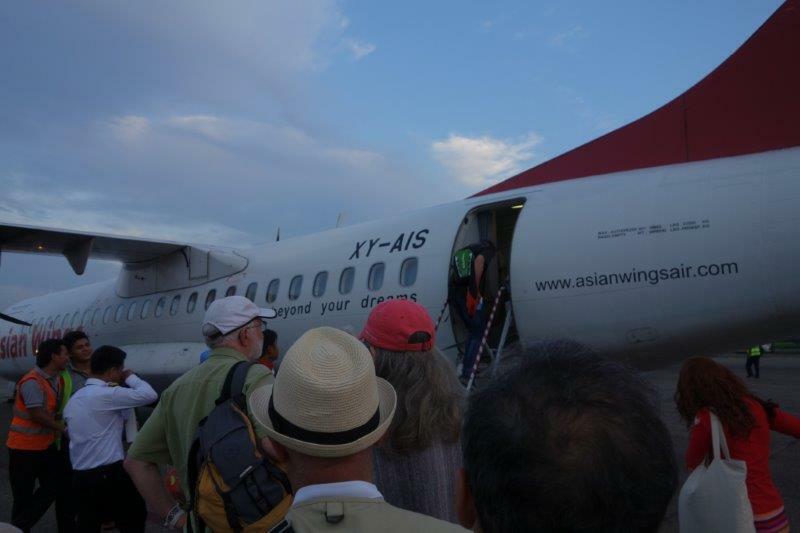 It was a good opportunity to meet some of the other passengers and, in my case, to find out more about our guide, Yi Mon. 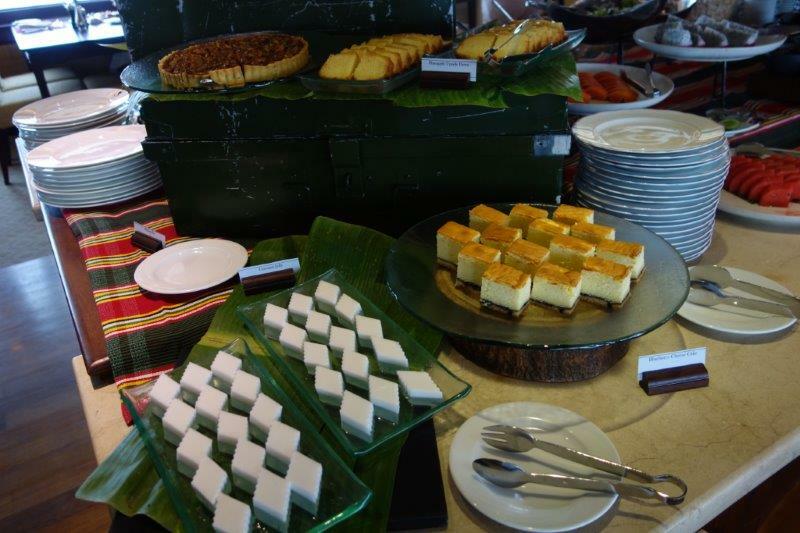 And after a delicious dinner – and the meals are always beautifully presented (and this buffet offering is always in addition to the menu with a huge choice of desserts for those who have any space left) there was the rugby match to look forward to. It was well after midnight by the time I got back to my cabin and we had an early start in the morning! Original generation time 2.1113 seconds. Cache Loaded in: 0.0567 seconds.